Numerical models are pervasive tools in science and engineering for simulation, design, and assessment of physical systems. In structural engineering, finite element (FE) models are extensively used to predict responses and estimate risk for built structures. While FE models attempt to exactly replicate the physics of their corresponding structures, discrepancies always exist between measured and model output responses. Discrepancies are related to aleatoric uncertainties, such as measurement noise, and epistemic uncertainties, such as modeling errors. Epistemic uncertainties indicate that the FE model may not fully represent the built structure, greatly limiting its utility for simulation and structural assessment. Model updating is used to reduce error between measurement and model-output responses through adjustment of uncertain FE model parameters, typically using data from structural vibration studies. However, the model updating problem is often ill-posed with more unknown parameters than available data, such that parameters cannot be uniquely inferred from the data. 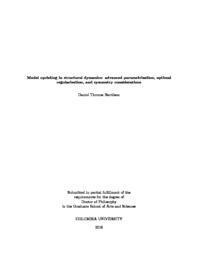 This dissertation focuses on two approaches to remedy ill-posedness in FE model updating: parametrization and regularization. Parametrization produces a reduced set of updating parameters to estimate, thereby improving posedness. An ideal parametrization should incorporate model uncertainties, effectively reduce errors, and use as few parameters as possible. This is a challenging task since a large number of candidate parametrizations are available in any model updating problem. To ameliorate this, three new parametrization techniques are proposed: improved parameter clustering with residual-based weighting, singular vector decomposition-based parametrization, and incremental reparametrization. All of these methods utilize local system sensitivity information, providing effective reduced-order parametrizations which incorporate FE model uncertainties. The other focus of this dissertation is regularization, which improves posedness by providing additional constraints on the updating problem, such as a minimum-norm parameter solution constraint. Optimal regularization is proposed for use in model updating to provide an optimal balance between residual reduction and parameter change minimization. This approach links computationally-efficient deterministic model updating with asymptotic Bayesian inference to provide regularization based on maximal model evidence. Estimates are also provided for uncertainties and model evidence, along with an interesting measure of parameter efficiency.